July 26, 2016, 11:33 a.m. The Labour recovery in Scotland doesn’t look set to be kicking off any time soon, with Scottish voters believing that both Nicola Sturgeon and Ruth Davidson are doing better than Jeremy Corbyn and Kezia Dugdale. Just 22% of Scottish adults think Corbyn is doing well as Labour leader and 25% think Dugdale is doing well as Scottish Labour leader. Shockingly, Corbyn’s numbers are actually even lower than the national sample among 2015 Labour voters, with just 19% thinking he is doing well - a decrease of 14 points since early May. His national numbers are boosted by the fact that more SNP voters (31%) think he is doing well than Labour voters. It’s unlikely that much of that support will translate into extra votes for Labour, however, as 84% of SNP voters think Nicola Sturgeon is doing a good job. Overall, Corbyn’s performing well/badly rating stands at -36 among all voters and -47 among 2015 Labour voters (Dugdale is still seen as doing more well than not by 2015 Labour voters with +12). By contrast, SNP leader Nicola Sturgeon is seen as doing well as First Minister by a healthy 62% of voters (up 3% since May), including a majority of 2015 Labour, Lib Dem and SNP voters. The record of her government to date stands at 45% approval to 33% disapproval – a decline of just one point since the beginning of May. 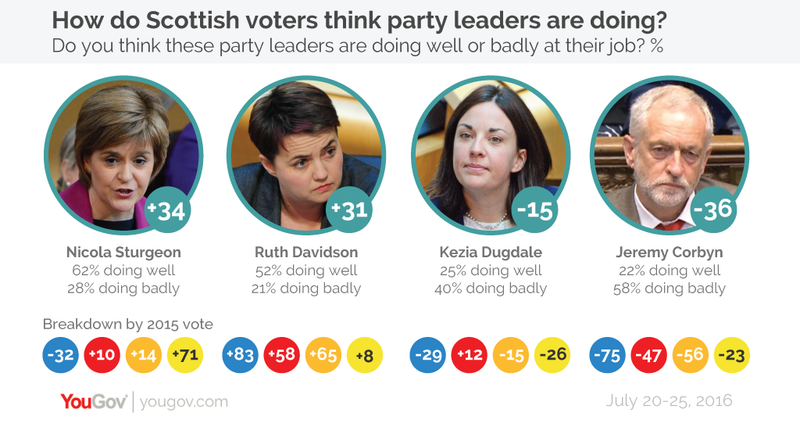 Scottish Conservative leader Ruth Davidson is now seen by a majority of voters (52%) as doing well - a 10 point bounce since May, possibly down to her well-received performance during the EU referendum. In stark contrast to Dugdale she is seen as doing well overwhelmingly by 2015 Conservative (88%), Labour (69%) and Lib Dem (73%) voters, and even SNP voters see her as doing more well than not (43% vs 35%). Theresa May becoming Prime Minister has largely been greeted with indifference in Scotland, with 38% of voters saying they don’t mind either way about the change. A further 22% of Scottish voters were dismayed by the change, whilst 17% said that they were pleased. Despite the Scottish public’s indifference to her new job, May will be pleased to find out her reputation among Scottish voters is solid – especially with the prospect of a second referendum on Scottish independence following the result of the EU referendum. The new Prime Minister has commanding leads in key characteristics – she is seen as strong by 66% of voters, competent by 62% and in control by 53%. She also is seen as more in touch than out of touch (40%/33%) and honest than dishonest (35%/24%). The only area in which May performs poorly is on likeability, with more people thinking she is dislikeable (35% vs 30%). In terms of expected performance, 60% of Scottish voters expect May to perform as well or better than David Cameron, with 28% expecting her to do better and 32% about the same, being particularly favoured among 2015 Conservative and Lib Dem voters.